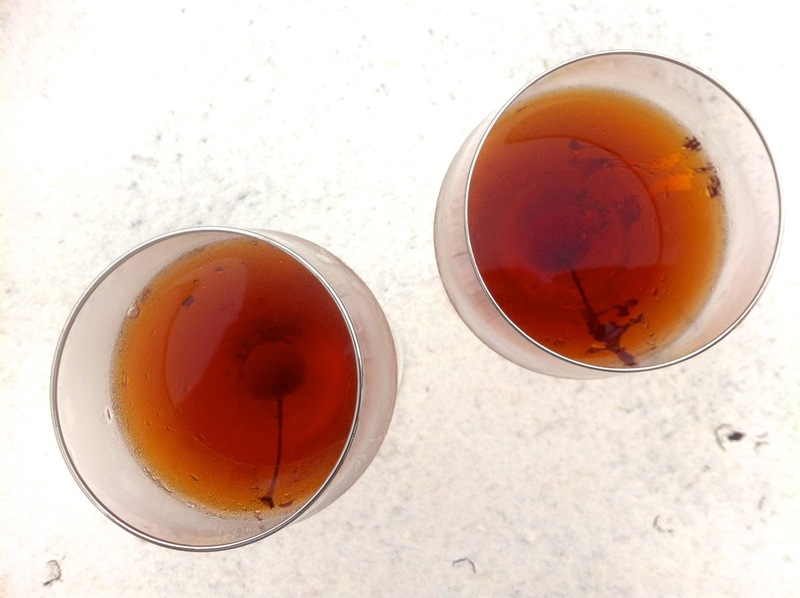 Pacharán, a Spanish sloe berry liqueur, is the star in this gorgeous Manhattan-style cocktail. The brandied and moonshined sour cherries are homemade. We may have forgotten most of the words, but that main refrain on our midafternoon walk around our neighborhood — along the streets we normally don’t take because they are not a part of our walk to and from the subway station — finally made sense, and revealed riches that provided us just the right amount of inspiration we needed to breathe new life into some classic cocktails we were beginning to take for granted. A relatively new wine and sprits shop near us, Passage de la Fleur boasts about a dozen shelves’ worth of natural and organic wines from around the world. Manager Emilie Kapp helped us understand the difference between organic (made with organically grown grapes) and natural (made with minimal intervention of chemicals and modern technology in both the growing and actual winemaking processes) and guided us through the somewhat confusing terrain of biodynamic wines (made by following strict, somewhat philosophical, post-harvest guidelines relating to ecological concerns). What caught our attention, though, were the spirits, liqueurs, and fortified wines lining the back shelf. 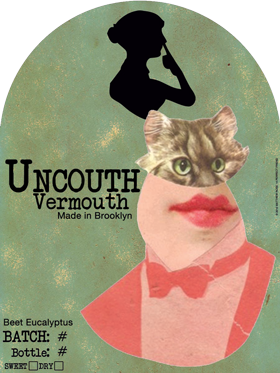 One in particular, sporting a tongue-in-cheek 19th-century silhouette of a woman in need of a handkerchief, was aptly labeled Uncouth Vermouth. We had heard of Uncouth Vermouth, the brainchild of Brooklyn denizen Bianca Miraglia, who began tinkering with wine at the Red Hook Winery. 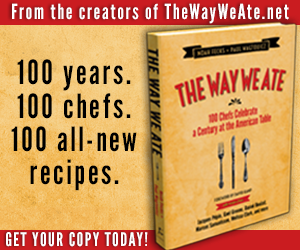 She infuses them with botanicals that bring distinct flavors to the fore, with such combos as serrano chile lavender, apple mint, and, the one we opted for, beet eucalyptus. Although reddish, the beet eucalyptus is dry and delicately balanced, so you won’t be put off if you have issues with either of these ingredients. It’s a perfect aperitif on the rocks, and also works well in cocktails that feature a standard dry French-style vermouth. 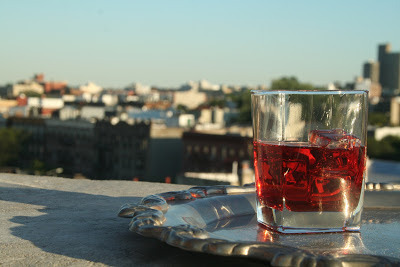 Emilie suggested Negronis, so we took her up on it and made some New York Negronis on the rocks that night that paired perfectly with some unseasoned, but lightly salted, sweet potato crisps. Stir in ice for 30 seconds. Strain into an ice-filled rocks glass. An orange twist might be nice, but is optional. Unseasoned, but lightly salted, sweet potato crisps. A New York Negroni and a Brooklyn view. Also on Passage de la Fleur’s shelves sat a bottle of Pacharán (Patxaran in Basque), a bittersweet Spanish liqueur made from sloe berries. Its flavor may be familiar to you if you’ve delved into the recently revived world of sloe fin fizzes. Take a sip. A bright tartness mingles with a lusciously rich and deep fruitiness that, together, linger on the palate; and since this Pacharán is aged in chestnut barrels, lucky for you, those lingering flavors will taste of bitter dark chocolate. 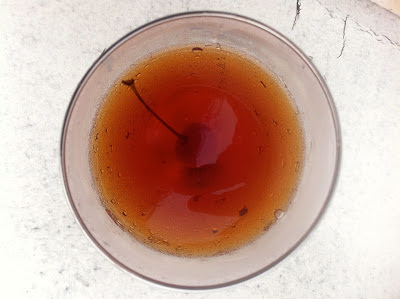 We already had a bottle of Baines Pacharán at home, so we were reminded of a Pacharan Manhattan we came up with a few years back when we were coming up with Manhattan variation after Manhattan variation. The vermouth we use in our Pacharan Manhattan is the bitter orange Punt e Mes. It matches the orange and star anise flavors inherent in the Pacharán, as do a few dashes of Angostura bitters, adding more spice to the mix. Stir in ice for 30 seconds. Strain into chilled cocktail glass or coupe. Garnish with a brandied cherry. With thoughts of neo-Negronis and hybridized Manhattans dancing in our minds, we continued our neighborhood journey, and alighted at the storefront of Güreje, a place we had passed many times, but never ventured into. Güreje is a new world clothier who applies old world techniques and patterns from around the world. This creates a visually arresting hybrid style that Jimi Güreje, the master dyer and owner, can call his own. Jimi showed us the back room, an expansive open gallery space for art installations, and a newly licensed bar area that will help to alleviate any thirst for patrons. There’s even an adjacent outdoor space, completely private from the neighborhood. A rarity. His bar should be open some time this month, so be sure to check it out when you’ve found yourself in Prospect Heights. We hope this has inspired you to walk around the block with your eyes wide open. You may be surprised by the recent creativity popping up around your neighborhood. 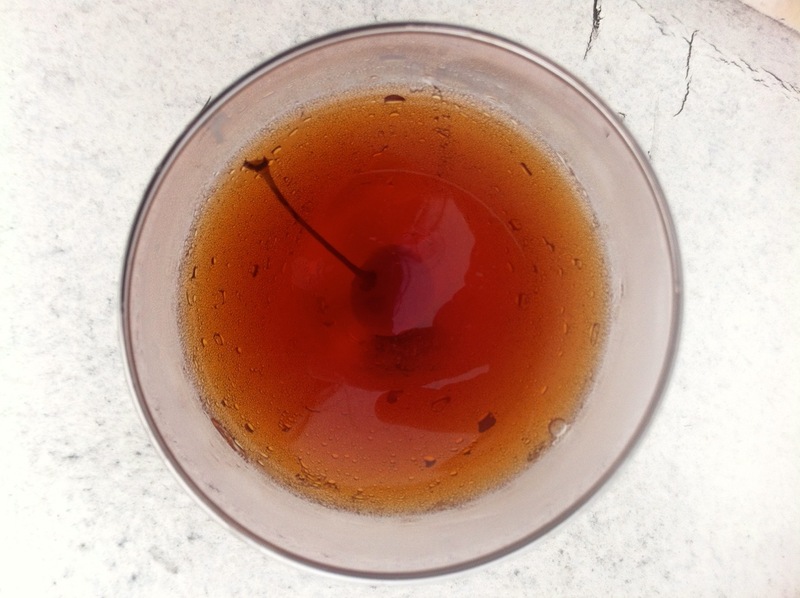 Look deep into the amber red glow of a Pacharan Manhattan; it beckons.